The reverse osmosis is a process that guarantees the production of water with a huge chemical and biological quality. The process of the reverse osmosis is based on a physical aspect in according to which the application of a most important hydrostatic pressure than the osmotic pressure that exists between two substance containing solutions with different concentration and separated by a semi-transparent membrane, permits the passage of water from a solution with an higher concentration of solutes to a solution with a lower concentration. The reverse osmotic equipments Cullwater using the property of particular semi -permeable membranes where the pores, with a diameter of 5 A° (0.0005 micron) and elevate pressure (14-20 bar) let them cross by the molecules of water and not by the salts, preventing from the passage of bacteriums, pyrogenic and organic substances representing the most sophisticated and efficient technology for the elimination of salts and other substances present in the water. 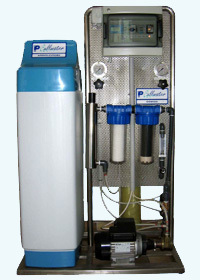 The reverse osmosis Cullwater equipments are completely built in inox steel. The unrefined water has a first pre-treatment of mechanic filtering with 20 micron in order to eliminate every parcels of suspension, then, a second pre-treatment of softening for the elimination of the alkaline-earth salts. The third pre-treatment is sterilization with UV rays for a bacterial decontamination, a fourth with an active carbonate filtration for the elimination of chlorine substances a fifth pre-treatment with mechanical filtering with 5 micron for the elimination of every parcels of carbonate in suspension. At the end the completely pre-treated water, is ready for the reverse osmosis treatments in order to reduce the salt to value suitable for the final use. The Cullwater builds for centers of hem-dialysis, pharmaceutical industries, photographic industries, cosmetic industries, laboratories of research and analysis.